Increase Communication Skills through Singing Lessons. Singing lessons can help improve communication skills. In today's world, so many of us rely on the computer to communicate all of our needs. Why not just send an email or text a message? These are wonderful advancements that allow us to communicate at a time that is convenient for us and the person you are interacting with can get back to you right away or at a time that works for them. BUT, what does that do for real face to face interaction and communication? If we always have our noses in our technology, we start to lose the ability to communicate by simply TALKING to someone. Take a minute and look at the flip side. How comfortable is the younger generation LOOKING at an adult when talking to them? Do they speak to them with confidence? 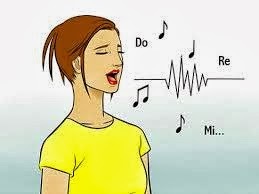 Singing lessons can help facilitate this and many other aspects of communicating by bolstering confidence and giving them to tools to express themselves face to face. Look them in the eye and tell them is something I frequently say in voice lessons with my students. When you are expressing the emotions of a character sometimes it is easier to express yourself than when you are trying to communicate your own emotions. Study of the lyrics enables the singer to see a new and different way to say something and how to show it in song. Not only do you learn to communicate with more confidence in singing lessons, you also spend time exploring the vocabulary of the English language (among other languages). What does the poetry really mean? What are the lyrics really saying? Is it symbolism? Or it may be a different way of saying the same thing. Exploration of the written word helps to expand someone's vocabulary. Knowing how to analyze lyrics helps you to also express yourself better. How can YOU say something differently to express yourself? When looking at lyrics to a song, we often see repetition of words. How do we express those words differently when we sing them to give them extra meaning or truly express what the character is trying to say? There are so many elements of singing that impact our overall ability to communicate- not only can you learn how to express songs with agility and ease, but can improve your ability to really connect with others and share your thoughts at a new and profound level. What do you think about how singing lessons facilitates communication in other aspects of life? Stay tuned for the extra benefit of singing lessons- An Emotional Outlet!